A lack of security across Egypt's archaeological sites has taken a toll in the town of Akhmim, near Sohag governorate. 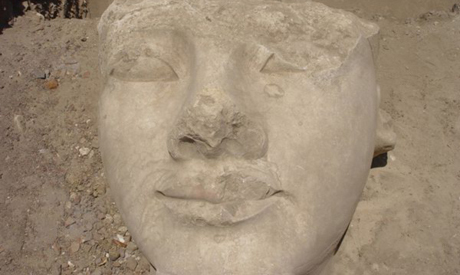 The area where a huge limestone head of Pharaoh King Ramses II was discovered six years ago was rendered a garbage dump. According to prior surveys, the area may house a vast temple to Ramses II, and more larger than life statues of the pharaoh could be unearthed. Because the head of the pharaoh king was uncovered within a modern cemetery in the town, residents were ordered not to bury their dead there for a few months until the cemetery could be relocated. The area was then proclaimed an archaeological site under the jurisdiction of Egypt’s antiquities law. The government, as well as the Supreme Council of Antiquities (SCA) at the time (now the Ministry of State of Antiquities), provided the required funds to relocate a group of modern tombs to another area. As the relocation of the cemetery continued, archaeological excavation discovered more items belonging to the temple beneath. Since the January 2011 revolution, all work was put on hold and the area neglected. Akhmim residents did not respect the serenity and historical value of the site and its monuments, and transformed the area into a garbage dump. It was frequented by drug addicts, neighbours said. Rubbish was strewn everywhere, and children played football over the remains of the temple. “This situation is not anymore the case,” Adel Hussein, head of the Ancient Egyptian Antiquities section, told Ahram Online. The head of Ramses II and all objects found there have now been moved to storage in the Sohag inspectorate, so as to protect them. The ministry's guards are also onsite, to protect it from illegal excavations or other negative encroachment. Akhmim was the hub of Egypt’s ancient weaving industry and the capital of the ninth nome of Upper Egypt, as well as being the religious centre of the fertility god Min, where a great temple dedicated to him was built during the ninth century BC. Greek historian Herodotus mentioned this temple and described it as a gigantic edifice larger than the Karnak complex. Akhmim was also a centre of Christianity in Upper Egypt. During the Christian era, temples were destroyed and the modern town was erected over ancient ruins. I been to Akhmim several time to film documentaries, you really smell the history even in the faces of its residents. However, It's very urgent to raise the culture awareness to push people to respect and be proud of their heritage.